I finally got to watch Weber State in person, and came away very impressed. It was a desperation game for Northern Colorado, and one they needed to win to feel decent about their chances to make the Big Sky Tournament. 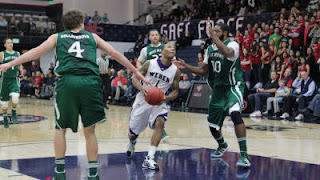 They have a good effort, but in the end Weber State was too deep, and Damian Lillard was too good for an upset to happen. With 15 or so NBA scouts in attendance, Damian Lillard delivered a show. He dropped 30 points for the eighth time this season, and did it in a variety of ways. He made 5/10 from downtown, and got to the line 14 times (making 13 of them). Even more than the points though, is that he was in complete command of the game. He had eight assists with one turnover, and got his teammates multiple easy baskets, including a couple off of in bounds plays. It was clear to see that he was the best player on the court. Northern Colorado was not happy with the way that Lillard was officiated, and while there were no blatantly bad calls from my point of view, it did seem like Lillard was getting the benefit of the doubt more often than not. Lillard shot 14 free throws, and UNC shot 19. In the past couple games, Lillard has been having some tough calls go against him, so I suppose this was things evening out. All that being said, there is no doubt that Damian is masterful at creating contact. One guy that was big for WSU which I did not expect was Gelaun Wheelwright. He has been looking better and better all year, but he was huge for them tonight. He had 11 in the first half (including 3/3 from downtown) and finished with 15 points. He is the clear #1 guard off the bench for WSU right now, and certainly looks in line to start next year, assuming Lillard leaves. He has a ways to go to becoming an all-around point guard and playmaker, but he has great quickness and puts pressure on a defense. Down low, I got a good look at Kyle Tresnak, who had 14 points in 20 minutes. There are still some things he doesn't do very well (like rebound), but strictly as a low-post scorer, he is one of the best of the Big Sky. He has a nice baby hook, and he knows how to handle himself around the basket. Kyle Bullinger and Darin Mahoney are not guys that jump out at you for the Wildcats, but they may be the toughest duo in the conference. For UNC, it was an emotional night for them, and senior Mike Proctor played very good ball in his final home game. He had a line of 15 points, 11 rebounds, and five assists, and really gave it his all out there. As the only senior on the team, he was the leader, and he will be missed. He was a lot of fun as a fan to watch, because you know he gave 100% at all times. We wish him the best of luck in the future. The Bears also showed a lot of promise, and a lot of what makes fans so excited about the team in the upcoming years. They got to within three points in the second half, but they ran out of gas. They went to some zone at times, which Coach BJ Hill said was in part to try to save their legs. Tevin Svihovec, Tate Unruh, and Paul Garnica are all guys with potential to be above average (and perhaps all-conference) players in the Big Sky, and the word I am hearing is that redshirt James Davis is a guy that athleticism and defensive tenacity that has been missing a bit in the backcourt. Their future is bright. For the present, it is Weber State who is king, as they sit at 14-1 with just a roadtrip to Montana remaining. The Grizzlies moved to 13-1, and should be 14-1 by the time the teams meet. Both teams are playing with tons of confidence, and playing great basketball. Just wanted to say how much I enjoy your blog. You have a great feel for the conference and seem very objective and fair when discussing all Big Sky teams. Perhaps you should take over radio duties for that moron Troy Coverdale in Greeley. I bet you'd call the games a thousand times better than he does.